Codestone Cloud Drive is fully integrated with MS Active Directory; users are able to access, share and synchronise files without the need for a separate logon or VPN. Codestone Cloud Drive also utilises NTFS permissions, this removes the need to recreate or separately manage file access permissions. Codestone Cloud Drive uses industry best practices and strong encryption techniques to securely store and transmit data. Not only is data encrypted with a unique key for your organisation, but also who accesses what, when and how if fully tracked and auditable. It is specifically designed to provide you with the flexibility to blend existing premise-based file servers and public and private cloud storage solutions. It’s as easy to use as generic solutions such as One Drive and Dropbox, but unlike most solutions, it’s fully customisable storage with enterprise-grade security. Enabling greater mobility and collaboration in your organisation – sharing information and having this information available from any device in any location. 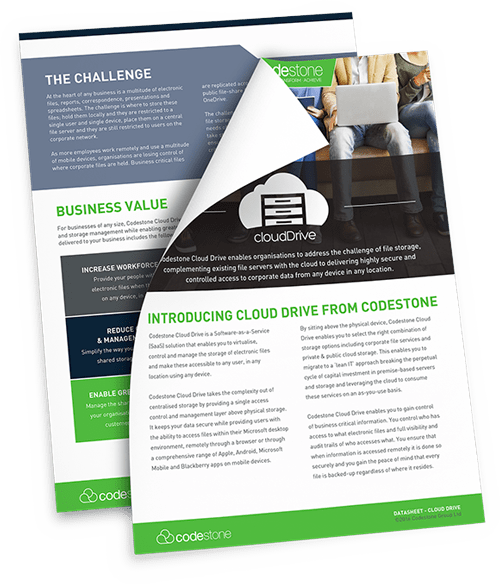 Find out if Codestone Cloud Drive is right for your business by chatting to one of our experts.